John Edward Keiser, resident of Oxford, OH, passed away on Saturday, February 3, 2018. 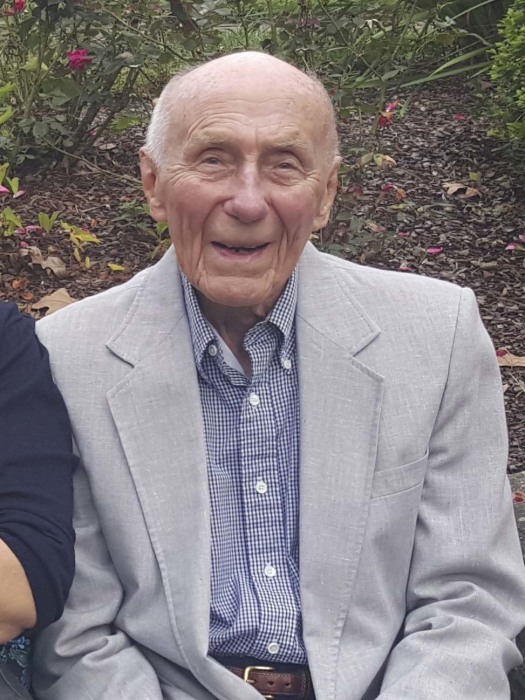 He was foremost known as a devoted husband, married for 62 years to Elizabeth (Mercer) Keiser, a loving father to his four daughters and son-in-laws, and a proud grandfather to nine grandchildren. He was also known for his kindness, intelligence, humor, and big-hearted laugh. He was born on September 17, 1918 in Youngstown, OH to John Henry and Minnie Autie (Schraum) Keiser. He received a B.S. in Chemistry from Youngstown State University, and started work at Youngstown Sheet and Tube. He served in the United States Army before and during World War II with the 65th Medical Regiment and as a chemical munitions officer. After the war, he used his chemistry knowledge in the appliance industry, developing patented technology in the field of porcelain engineering. He worked for Seeger Refrigerator in Minneapolis/St. Paul, MN, which later became the Whirlpool Corporation. While in Minnesota, he met his wife, Elizabeth Mercer, and was married on September 17, 1955 in Youngstown, OH. They had four daughters in Minnesota before moving to Findlay, OH with the Whirlpool Corporation. He continued working with Whirlpool as a porcelain engineer in Findlay, OH until his retirement in 1983. John was a devoted Lutheran. He was a member of St. John’s Lutheran Church in Findlay, where he spent 40 years teaching adult Sunday school, serving on church council, and leading adult small groups. Most recently, he was a faithful member of Faith Lutheran of Oxford, OH. He believed strongly in serving one’s community and over the years volunteered for many organizations including Salvation Army, Exchange Club, and the American Red Cross. When he moved to Oxford, OH at age 88, he helped to deliver Meals on Wheels. A lifelong learner, he and his wife traveled the world during his retirement and held special memories of being in China, Germany, and the United Kingdom. He particularly enjoyed educational tours that combined courses of history and natural sciences with his travels. John was an avid outdoorsman and spent many family vacations camping, hiking, canoeing, and fishing the state and national parks of the United States. He especially loved seeing the northern lights and hearing the call of the loon in the Boundary Waters Canoe Area of Minnesota and Canada. He was preceded in death by his parents, John and Minnie Keiser, and his brother, Robert Keiser. He is survived by his wife of 62 years, Elizabeth Keiser, his four daughters and sons-in-law, Carol (Bryan) Bishop, Linda (Todd) Shipman, Jane (Norm) Krumpe, and Suzanne (Taylor) Surface, and grandchildren David and Kristen Bishop, Caleb and Katherine Shipman, Sarah (Shipman) Kwidzinsky, John Krumpe, and Spencer, Evan, and Andrew Surface. A visitation will be held at the Ogle & Paul R. Young Funeral Home, 5086 College Corner Pike, Oxford, OH on Wednesday, February 7, 2018 from 6-8 PM. A visitation at 10 AM, followed by a Celebration of Life service at 11 AM will be held at the Faith Lutheran Church, 420 S. Campus Ave, Oxford, OH 45056 on Thursday, February 8, 2018. In lieu of flowers, donations may be made to the Faith Lutheran Church Youth Program, 420 S. Campus Ave, Oxford, OH 45056.